Being both a violinist and an ophthalmologist may sound like an unlikely combination, but for third-year resident Anne Langguth, MD, it makes perfect sense. 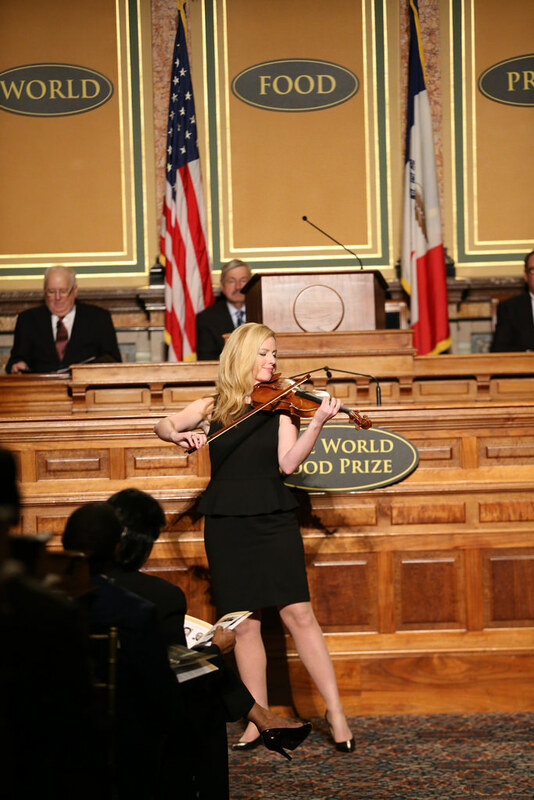 Anne Langguth, MD, performs at the 2016 World Food Prize Symposium and Laureate Ceremony. Langguth began playing the violin when she was just three years old. After mastering her first instrument, she went on to learn piano and harp. While she loved music, she knew early on she wanted to become a doctor. “By seeing how my doctors would make personal connections to me in a way that I had only experienced before through music, I knew I wanted to be a doctor. They opened my eyes to the idea that music and medicine allows us to find the opportunity to relate to someone on a different level, which is incredibly rewarding,” Langguth said. Langguth is a third-year resident in the Department of Ophthalmology, having earned her undergraduate degree from Harvard University in government health policy and her medical degree from the University of Iowa Carver College of Medicine and completing a one-year internship in general medicine at New York University. What attracted you to a career in ophthalmology? As a medical student, I was initially drawn to surgical specialties. I enjoy the operating room and I like using my hands, which I think comes from playing my violin. I also enjoy forming relationships with my patients. Ophthalmology offered me the opportunity to pursue something I find interesting, is hands-on in nature, and allows me to have long-term, meaningful patient encounters. How does your background in music influence your work in residency? For me, music opens the mind to creative thought, so whether I am with a patient in clinic or in the operating room, I try to think of new and innovative ways to treat my patients. With music, we start with a piece of paper with black notes written on it and from there we interpret it and craft it into something that’s our own, and something that can be appreciated by an audience. I find that skill translates well into medicine: taking a standard problem and being able to shape your treatment plan to a specific person and tailor it to their unique life experience. A second thing I have learned from the practice of music is a commitment to life-long learning. Whether it is medical school, residency or medical practice, one has to remain committed to, and always striving to, reach a meaningful goal. 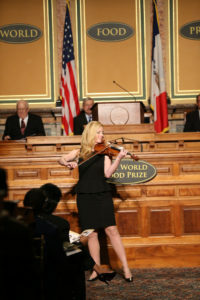 You recently had the opportunity to perform at the World Food Prize Symposium and Laureate Ceremony; can you tell us about this experience? I was originally invited to give a short speech at the symposium about the intersections of art and science. When I arrived, the musician, an opera singer from South Africa, who had been scheduled to perform, had an issue with her flight. The organizers asked me if I had my violin, and luckily I did. I ended performing for the symposium guests, which was such an honor. (Watch Langguth’s performance here). A little, but I don’t remember a time when I didn’t play music, so expressing myself through musical performance is very natural. A lot of times music expresses my thoughts in a way that I don’t necessarily have the words to articulate. Aside from occasional performances, do you still practice music in your free time? I do, though not as often as I would like. Residency is a challenging time, but music is something I always try to make time for. During the holidays my family loves to play music together. It’s been a great way for our family to come together and bond. Why is practice important to you? As physicians, we encourage our patients to practice wellness, but finding the time to do that for ourselves can be challenging. For both our patients and ourselves, we need to make time for the things that make us whole. For me, music provides a time to reflect, as well as a unique way to share emotion and bring people into what I am feeling. Why did you choose Northwestern? When I interviewed here, I immediately had a very warm and welcoming reception. I felt that especially in the Department of Ophthalmology. All of the faculty and the staff are so excited to teach and share what they do with others. That definitely came through in the interview and it comes through every day. It’s a great feeling to be excited to go to work, because I am happy to see the people I work with and I know there’s an air of mutual respect between us. What has been your favorite experience at Northwestern? It’s hard to choose just one, but one thing that has been fun is the relationships we get to make with fellow residents in other departments. In the first years of residency, we have many emergency room consults and overnight shifts. Through this I’ve really gotten to know the ER staff and residents, as well as residents on other services. It’s been great to develop these relationships and sense of camaraderie amongst different specialties here at Northwestern.